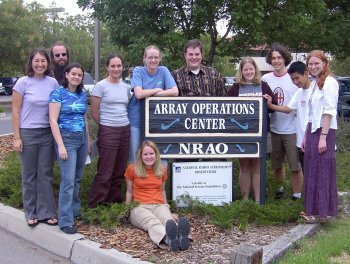 A variety of programs is available for teachers and students at the Very Large Array or through the National Radio Astronomy Observatory at several of our locations. The majority of our programs are described on our main page for teachers and students. New Mexico Tech offers Radio Astronomy for Teachers every other summer through its Master of Science Teaching program. The first class was held in the summer of 2004. Their presentations and research findings are posted here. For information about radio astronomy, its history, and how the telescopes "work", see What is Radio Astronomy? For those seeking lesson plans concerning radio astronomy a number of websites are available. This page will be updated as more programs become available.